Beovision LX was the result of several generations of development. Superb technology offering a wealth of functions. And the elegant design was sheer pleasure to look at. 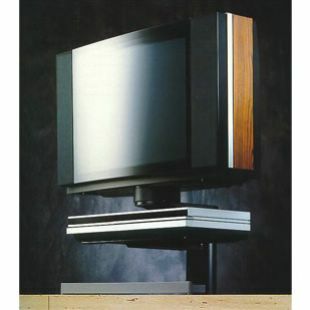 Without doubt, Beovision LX was a thoroughbred, according to Bang & Olufsen's 1990 catalogue. And the Beocord VX5000 video cassette recorder a worthy stable mate. Bang & Olufsen continually seeks new ways not only to streamline operation and function but to simplify exteriors. The powerful speakers of Beovision LX had a totally smooth facade when they were originally introduced in 1990. The contrast screen in front of the picture tube stretches from the very top to the very bottom of the cabinet. And the lacquer was as polished as a grand piano's. The result was unity; no knobs or displays interrupted the flow. You could keep an eye on more than one programme at a time by letting a miniature picture run in one corner of the screen. Or you could show 4, 9 or 16 'clips' from programmes on air at that very moment. Beovision LX 5500 also gave fast, direct access to to four Teletext pages you used the most. And there was room for a satellite receiver to be installed as well as using the TV set for the connection of extra speakers, loop amplifier for the hard of hearing and TV game consoles. By mounting the whole TV set on a motorised base, you could sit in your armchair and turn the TV up to 35 degrees to each side with just one press of your Beolink 1000 remote control terminal. By programming it into the set, the TV then turned automatically towards your favourite viewing position every time the set switches on. And, naturally, the TV returned to centre stage each time you switched it off. A stage designer can creative positive associations of purity by using predominantly white or light grey in stage sets and costumes. White and grey symbolize a simple style of living and, as the audience, we associate this virtue in our mind's eye with the person who decorates with, or dresses in, these light colours. In interior design white and grey give a modern impression with everything blending together, perfectly executed down to the tiniest detail. For those who prefer an all-white look,. Bang & Olufsen in 1990 dressed its Beovision LX range completely in white; even the back. You could put Beovision LX White Line in the middle of a large room if you so desired. It looked discreet and elegant and spoke its own, well-modulated design language. If a pleasant light grey was more to your taste, the Beovision LX range was available in a light grey finish too. All the other technicalities internally were identical to the other LX family members.